A white, healthy smile is everyone’s envy. It is wonderful for those who can flash their white teeth but it can be sad for those who have stained and discolored teeth. Stained and discolored teeth are a common dental problem, necessitating teeth whitening. Regular dental checkups and cleanings can keep stains and discoloration at bay, but some need more. 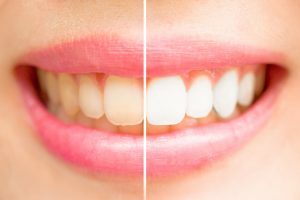 People with stained and discolored teeth don’t need to worry, as there are several effective teeth whitening procedures available to have white teeth. Teeth whitening can be achieved with an OTC whitening product or by purchasing a whitening kit directly from your dentist. Over-the-counter teeth whitening products include whitening strips, gels, rinses and tray-based tooth whiteners. They are available in most drugstores and department stores. These teeth whitening products may help whiten your teeth, but they are not as strong and effective as the products advised by your dentist. You need to use these whitening products for a long time before you are able to see good results and the prolonged use can be harmful to your dental health. Weakened enamel and tooth sensitivity are common side effects from OTC whitening products. Take-home whitening kits are recommended by dentists. They are actually the same as the whitening products found in stores, except that they have stronger chemicals; so results are quickly seen. Your teeth will whiten dramatically if the precise directions are followed. Compared to over-the-counter whitening products, a take-home kit is more convenient and guaranteed because it is recommended by your dentist. After a routine dental exam and teeth cleaning procedure, the dentist will send you home with the kit. You will be scheduled for a follow-up appointment to check if the kit worked with you and if you were happy with the results. If you want to see immediate results, then choose the in-house whitening procedure; which takes about 45 minutes from start to finish. Dr. James Voyles assures their in-house teeth whitening procedure will lighten your teeth 5 – 10 shades. Gums and lips will be covered first. To make the process faster, a special light will be directed at your teeth. The gel will be applied again. After the 15-minutes, you’ll be ready to go flash your white teeth. Call Voyles Family Dental now if you’re wanting a brighter, cleaner and whiter smile.